I’ve had this kind of discussion recently as well. 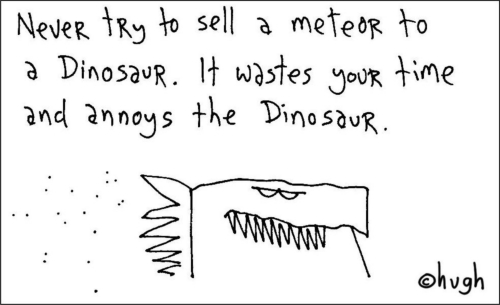 Hehe, I wonder what the benefit of a meteor would be for a dinosaur? “You’ll be a cool fossil being shown in a museum in 65 million years!” doesn’t sound too convincing ;-). Let me put it another way: selling hierarchies the instruments that will dissolve hierarchy is kind of hard.